Free Christmas Vocal Sheet Music "Gaudete"
Free Christmas vocal sheet music "Gaudete" with piano and guitar tabs, 3 versions, below. This beautiful Christmas carol is very old -- and very unusual. The elegant rendition above by The King's Singers is totally outside the experience of a lot of pre-college students... but it shouldn't be! 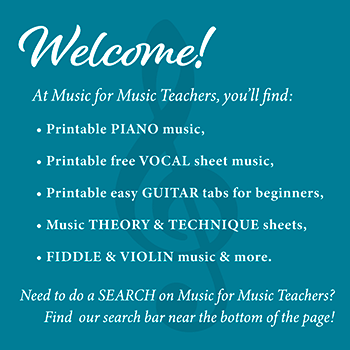 Scroll down the page for the links to the free printable PDFs of sheet music. The English translation of the Latin text is not meant to be sung; it is more literal than poetic. I always like to know what I am singing. The words of this free Christmas vocal sheet music are truly beautiful. The shifting rhythm is reflected in the changing time signatures; there is a version at IMSLP that does it all in 4/4 time, but it's good for students to wrestle with a shift from 2/4 to 6/8. Think of it as an opportunity! What first attracted me to this Christmas song was noticing how the shape of the medieval-sounding chords looked so easy to do on guitar... and I thought how nice this piece would sound with guitar and recorder or other treble instrument together. The guitar part - for fingerpicking, of course - is not difficult. The hardest thing for the guitar player will be coordinating with the melody instrument. Try this piece at your next Christmas (or any) recital - it will really break the routine and inject a fresh sound into your students' repertoire! Download free Christmas vocal sheet music "Gaudete"